Meet the new Honda Civic Type R near Atlanta, Georgia. This high performance Civic is powered by a 306-Horsepower, 2.0-Liter VTEC® Turbocharged and Intercooled DOHC 4-Cylinder Engine with Direct Injection. It offers sporty driving dynamics courtesy of a Close-Ratio 6-Speed Manual Transmission and allows the driver a choice between three drive modes: +R, Sport & Comfort. The Type R race-inspired exterior features include an aggressive front bumper with LED headlights, 20-inch alloy wheels and a striking wing spoiler above the hatchback door. Sporty interior features include a flat bottom leather-wrapped steering wheel and heavily bolstered red and black front seats, emblazoned with the TYPE R logo. This new Civic has been built to satisfy race enthusiasts and everyday drivers alike. It delivers a thrilling ride, comfort, safety and plenty of curb appeal. 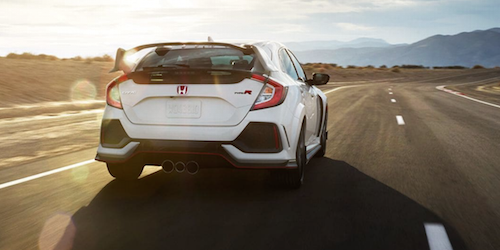 The Ed Voyles sales team can help you find a new Civic Type R with all the features you want at a price that fits your budget. We offer affordable financing and leasing in our Honda Finance Center and frequently run dealer specials and lease offers, so you are sure to get our best price. We invite you to stop by, meet the team and test drive the new Honda Civic Type R near Atlanta, GA soon.